With a revised version of the Toyota GT 86 underway, the Japanese coupe might finally get the more powerful drivetrain enthusiasts have been clamoring about since its launch in 2012. Meanwhile, Toyota is trying to keep customers happy with all sorts of special-edition models. Following the introduction of the Scion FR-S Release Series 2.0 at the 2015 SEMA Show, Toyota has crafted yet another limited-edition coupe. 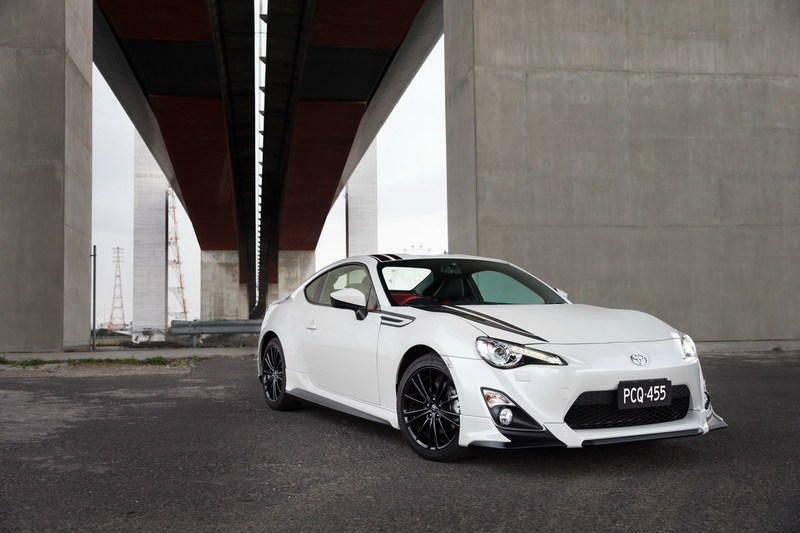 This time around, it’s being offered in Australia and goes by the name GT 86 Blackline. Based on the range-topping 86 GTS, the Blackline package adds a subtle body kit, a new paint scheme, new wheels, and a sportier interior, most of which is sourced from TRD — Toyota’s motorsport division. Limited to only 450 units, offered with both manual and automatic transmissions, the GT 86 Blackline marks the start of a six-month countdown to the first round of the Toyota 86 Racing Series. For the uninitiated, it’s a one-make racing series that’s set to commence in Australia in May 2016. The new series, which was created for pro-am drivers, will run as a support category to the highly popular V8 Supercars Championship. 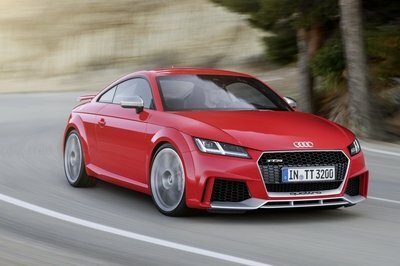 Each entrant will drive a production-based T86RS model, with details about the car to be released soon. 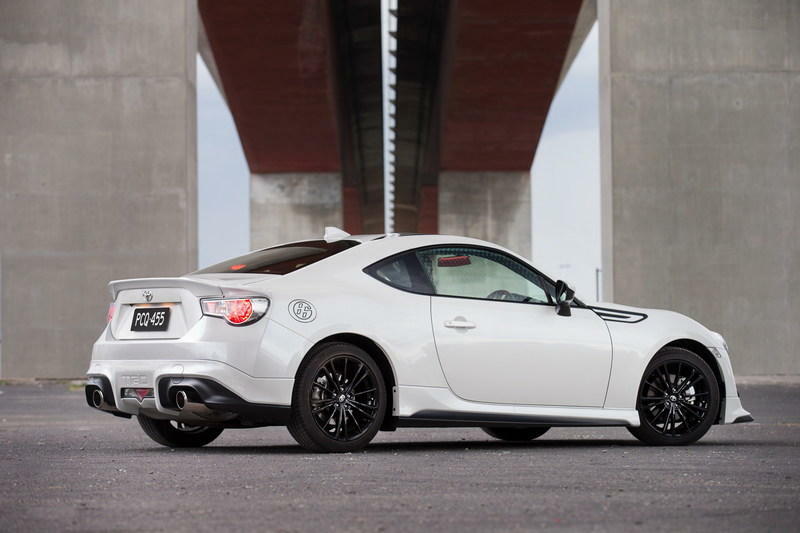 In the meantime, let’s have a closer look at the GT 86 Blackline limited-edition below. Continue reading to learn more about the Toyota GT 86 Blackline. Arguably the most noticeable changes were operated on the outside by means of a TRD-built body kit and a black-and-white livery. Although subtle, the body kit modifies several body parts, making the Blackline seem a bit more aggressive than the standard model. The package includes a black splitter, which goes well with the black foglamp surrounds, protruding side skirts, a trunk lid spoiler, and a new bumper. The latter has a body-colored upper section (which on the standard car is black) and a body-colored center piece that creates the impression of a two-piece racing diffuser. The black parts that surround the exhaust pipes extend toward the rear wheels in order to create a unitary appearance with the black skirts and black front splitter. Rounding off the exterior are a set of gloss-black, 17-inch alloy wheels, a White Liquid paint, and the twin black stripes on the engine hood and the roof. All told, the Blackline name fits the limited-edition model like a glove, mostly because of its black-and-white finish. Step inside and you’ll find the same features as Australia’s range-topping GTS model. These include a 6.1-inch touchscreen with navigation, live traffic updates, reversing camera, scuff plates with stainless steel inserts, dual-zone climate control, keyless start, and aluminum pedals. The steering wheel is wrapped in leather, while the seats have leather side surfaces and Alcantara inserts. Despite the name, the Blackline package adds splashes of bright-red on the seats, steering wheel, gearshift knob, handbrake level, and door grips. The steering wheels, the seats, the shifter, and the handbrake lever also get red contrast stitching on their black surfaces. Though it might not seem like much, a quick glance and the photos reveals a sporty two-tone interior. The red inserts make quite a difference when paired with an overall black cockpit. Much like any other special-edition GT 86, the Blackline comes with no drivetrain modifications whatsoever. 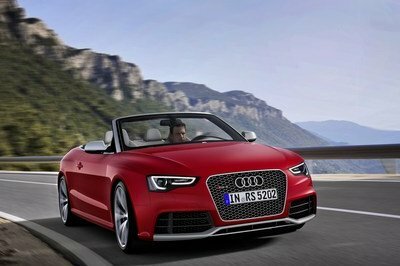 The coupe uses the same 2.0-liter, four-cylinder engine rated at 197 horsepower (147 kW) and 151 pound-feet (205 Nm) of torque that mates to either a six-speed manual transmission or a six-speed automatic gearbox with paddle shifters. 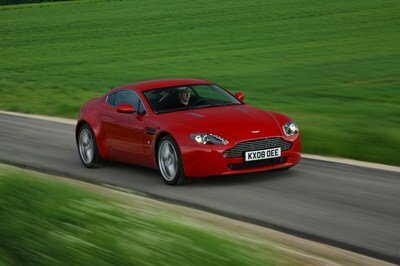 Despite the body kit, sprinting from 0 to 60 mph is likely to remain unchanged at a little more than seven seconds. Production of the GT 86 Blackline will be limited to 450 units, including 250 vehicles with manual transmissions and 200 models with automatic gearboxes. Prices start from AUD$37,990 (about $27,510) with the manual and from AUD$40,490 (around $29,320) with the automatic. Interestingly enough, the Blackline is priced under the 86 GTS, which retails from AUD$40,568 (about $29,370) with a manual and from AUD$43,143 (around $31,240) with an automatic. All vehicles are included in Toyota’s capped-price Service Advantage servicing plan with up to four scheduled services at just AUD$180 each. 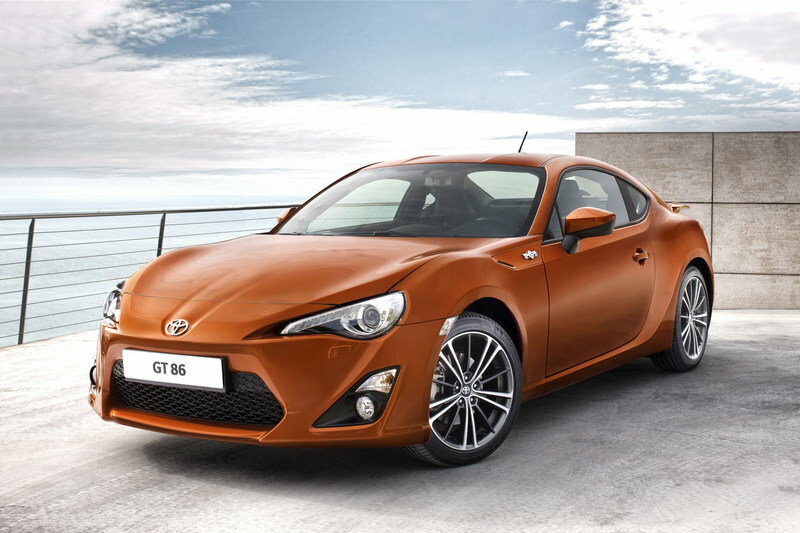 The Toyota GT 86 was launched in 2012 as a two-door, affordable sports car. Co-developed with Subaru, the GT 86 is available with three badges globally. While the Toyota is marketed in Europe, Asia, and Australia, the United States get both the Scion FR-S and the Subaru BRZ. 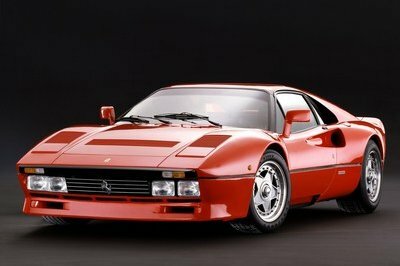 All North American models are rated at 200 horsepower and 151 pound-feet of torque, three extra horses over the Euro-spec vehicles. The Scion FR-S retails from $27,200, while the Subaru BRZ can be had for $25,395 before options. Read our full review on the Toyota GT 86 here. Toyota is marking the start of a six-month countdown to the first round of the Toyota 86 Racing Series by releasing a special-edition version of Australia’s best-selling sports car. Known as the Toyota 86 Blackline Edition, it features a subtle body kit, gloss-black 17-inch alloy wheels and distinctive red highlights in the sporty black interior. The newest 86 derives its special-edition name from the twin black stripes on the roof and bonnet, accentuated by the model’s “white liquid” exterior paint colour. Based on the high-line 86 GTS, Toyota is producing just 450 of the 86 Blackline Edition cars ‐ 250 manuals priced from $37,990* and 200 automatics priced from $40,490*. Feature items have been sourced from Toyota’s acclaimed engineering and motorsport partner TRD including front spoiler, side skirts, three-piece rear spoiler, rear lower bumper and fender garnishes. 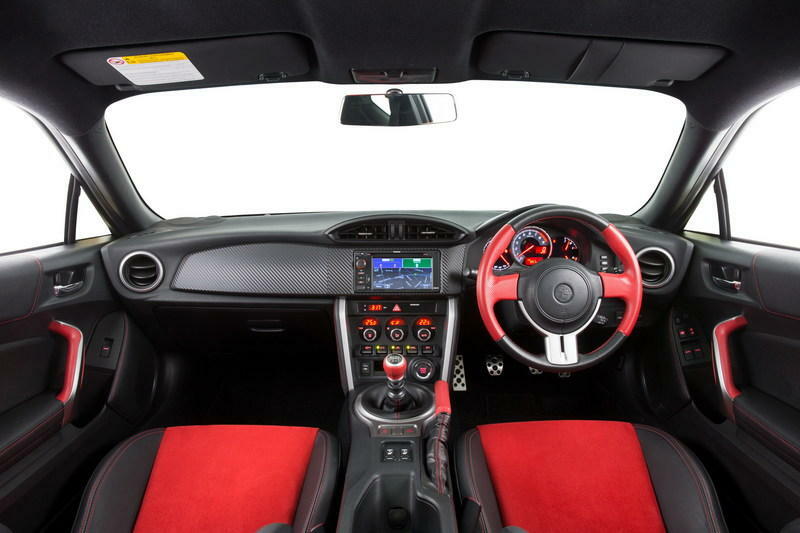 Inside, the new package sets the Toyota 86 Blackline Edition apart with dramatic splashes of red on the seats, steering wheel, gearshift knob, handbrake lever and door grips. Release of the special-edition 86 coincides with an announcement that the Toyota 86 Racing Series is due to hit local racetracks from May. Each of next year’s five rounds will offer a starting grid of up to 32 cars at selected V8 Supercars events, including Sandown in September and Bathurst in October. Since its launch in 2012, the 86 has been Australia’s best-selling sports car with more than 15,600 sold to local customers. The 86 has attracted a cult following with its fun-to-drive rear-wheel drive dynamics powered by a 147kW, 205Nm 2.0-litre direct-injection four-cylinder engine and a choice of six-speed transmissions. Other standard features on the Toyota 86 Blackline Edition include a 6.1-inch touch screen that displays satellite navigation# with live traffic updates, reversing camera image and audio interface. Exterior fittings include auto-levelling HID headlamps, front foglamps, LED daytime running lamps and keyless smart entry. Stepping inside over the scuff plates with stainless-steel inserts, owners are treated to dual-zone climate-control air-conditioning, keyless smart start, leather-accented front seats with Alcantara® inserts and aluminium pedals. Every Toyota 86 is equipped with seven airbags, reversing camera, cruise control, stability and traction control, anti-skid brakes and a multi-information display. 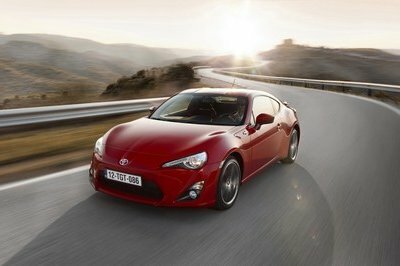 The Toyota 86 Blackline Edition cars are included in the capped-price servicing plan Toyota Service Advantage with up to four scheduled services at just $180 each^.